Mainly been pushing pixels over the last day or so. In my last post I mentioned that I wasn’t at all happy with the ‘boulder’ tile I’d been using for the foreground section of the landscape. In Jetboard Joust (unlike Defender) you interact with the terrain, and as my physics model is probably only going to allow for simple rectangle-based collisions this necessitates that the terrain is made up from a simple rectangle-based modular tileset. Rather than go for a ‘natural’ feel to the landscape I thought I let the restrictions dictate the visuals to an extent and try a kind of ruined, ominous ‘space city’. A bit like a sci-fi version of an old aztec temple or something. I looked at a bunch of stuff for reference, the kind of thing that seemed to fit the best was an approach vaguely along the lines of ‘Fez‘, ‘Hyper Light Drifter‘, and some of the Capybara games such as ‘Superbrothers Sword & Sorcery‘. 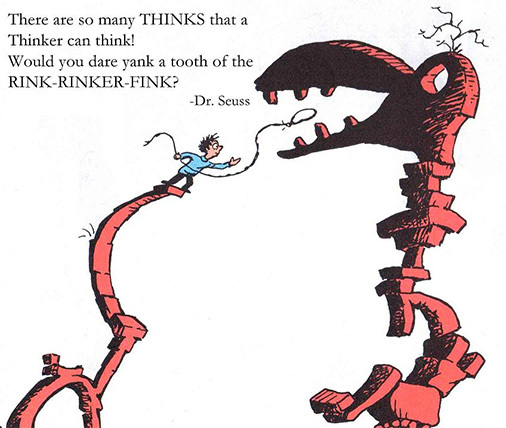 I was also thinking a lot about Dr.Seuss landscapes, particularly the Rinker Rink Fink which always struck me as being really weird and slightly spooky. Difficult to get that across in a rectangular tileset though – I’ll come back to that later. 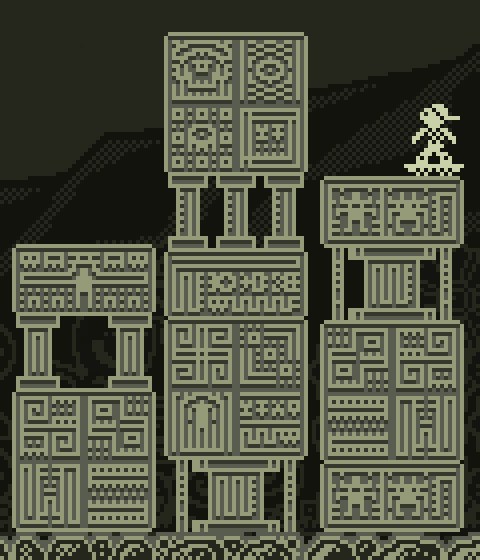 First thing I did was design some solid ‘block’ tiles. When I was happy with these I tried a few different approaches to shading to add some depth. Couldn’t decide on which approach to go for so I asked for some input on Twitter. Most people preferred the approach on the left (the simplest) whereas i was drawn more to the one on the right (the most complex). In the end I went for the one in the middle which seemed to be a good compromise between depth and clarity. I did try the leftmost approach in-game but it just felt too ‘flat’ to me. Next I designed a bunch more tiles, including some more open ‘connector’ tiles, and set about writing an algorithm to construct the buildings randomly. What was key here was to make sure that too many ‘solid’ tiles weren’t stacked up on one another without a connector as this looked odd. Then an algorithm to distribute the buildings was needed. What I found worked best was if the buildings were placed together in small ‘clumps’ with a slightly larger gap every three or four buildings or so – also if there were never two buildings of the same size next to each other. Lastly I added some ‘chips’ to the tileset which are placed semi-randomly over the buildings so that they look a little battle-worn. These ‘chips’ may still need a bit of work but I think the feel is there. I still need to add more tiles, especially some more ‘open’ ones with windows and arches or something, but I’m pleased with the end result. It has a certain atmosphere that I think works. Now I am unsure whether I need to change the main character and the ground tile to be more in-keeping. It’s a never-ending merry-go-round! This entry was written by bitbulldotcom, posted on February 25, 2016 at 10:20 am, filed under Art, Development, Jetboard Joust. Bookmark the permalink. Follow any comments here with the RSS feed for this post. Post a comment or leave a trackback: Trackback URL.